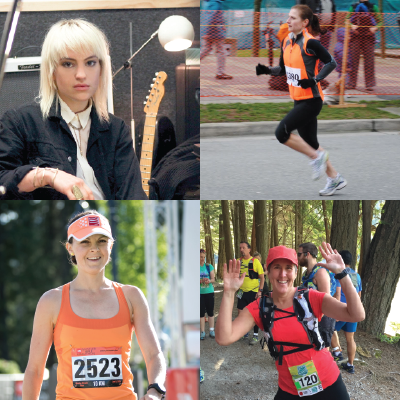 Prepare to be INSPIRED by four amazing women. This inspiration session with these 4 inspirationalists is proof in the proverbial pudding that we all have a capability to reach for distant goals and accomplish them. Coming to us with four different stories of survival, perseverance, determination, grit, and how running has effected their lives; we guarantee that you will leave this session with a sense that you can do whatever you set your mind to. ​My name is Mary Linton. I am 39 years old and have been a runner for as long as I can remember. I have run several marathons and half marathons over the years. The first time I decided to go for a run was out of boredom, and I fell in love with it. Running was always an outlet for me: when I am angry, I run; when I am sad, I run; when I feel anxious, I run. And I would always feel better about things after. In 2006, things changed. While I was training for a marathon, I got sick. Doctors told me that I would start to feel better in a couple of weeks that it was just a cold. Weeks passed and I wasn’t getting better, I was getting worse. After months of not knowing, I was diagnosed with a rare condition that medication wasn’t helping. The only option for me was a double lung transplant. In January 2007, I was put on the transplant waitlist. Waiting is the hardest thing to do, but I finally received a call from the hospital May 3, 2007 to have my transplant. 6 months after my transplant, I completed a 10 km run. One year after my transplant, I completed a half marathon. 3 years after my transplant, I completed a marathon. And now, 9 years after my transplant, I am still running. "This morning, like many mornings recently, I woke up feeling not great about my body. but then I ran my first race: a hokey little 10k on the beach with a chalk drawing of a bunny as the finish line. the contrast between what my body did for me today, which surprised me, and how I've been feeling about it of late, is pretty stark. I hope you all have the most loving and celebratory of days -- life is too short to skimp on appreciating your body as a gift." This fateful post on Facebook the morning of that run has brought her here to run with us and has led to this inspiration session. A classically-trained violinist, she has spent the last ten years as a member of alternative rock band The Airborne Toxic Event, best known for RIAA-certified Gold single, "Sometime Around Midnight." With Airborne, she has performed on GOSSIP GIRL; on late night TV shows hosted by David Letterman, Conan O'Brian, Jimmy Kimmel, and Jay Leno over fifteen times; and in venues and major music festivals around the world, including Red Rocks with the Colorado Symphony. She has also recorded and performed on violin and viola with artists including Edward Sharpe and the Magnetic Zeros, Kanye West, Vampire Weekend, and most recently, Beyoncé's LEMONADE. She currently fronts and composes music and lyrics for dream-gaze band, the Bulls. Our session will be hosted by Whistler resident, Jennifer Black. Jen is a long time runner, veteran of more than two dozen marathons, and recently her first Ultra - Zion. As an elementary school teacher, mother of 2 boys, and general busy body; Jen finds her balance in life through running. ​As a cancer survivor, she inspires everyone she touches to reach for the stars, get "gritty" and live life to the fullest.